Microsoft has renewed the trademark for Scalebound, which has of course sparked a ton of rumors on the internet. In January of this year, Microsoft announced that it had cancelled the long-awaited Scalebound from Platinum Games. It was a blow to fans of the game and the Xbox One, as the game was one of the most-anticipated for the console, and had been in development for four years. The noise around the game had largely died down, and most folks had accepted that it wasn't going to happen until today, when it came to light that Microsoft had renewed its trademark on the game's name. This was the second trademark extension that Microsoft had filed on Scalebound. The news appeared on SomosXbox, which found the trademark renewal on Justia Trademarks. Once the word got out, rumors began flying that Microsoft was working on the game again, with one user going so far as to post that "Development is resumed, led by and entrusted to an important "close" MS team." Obviously, this is a lot of stretching based on just a trademark renewal. While it could be the case that MS is working on bringing the game back to life, it could also be that it just wants to protect the IP and its rights to the name. In fact, Windows Central says that its sources say that "Scalebound is not in development by Microsoft or a 'trusted team.'" It sounds like the odds are that this is nothing more than a company protecting its interests in a game that it has already invested a lot of time and money into. 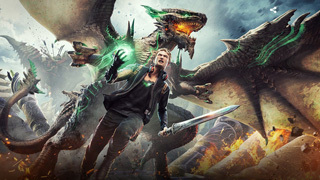 As much as you might want to see Scalebound return, it doesn't sound likely at this time. My cynical side thinks they're doing this so that no other company can scoop in and save the game and add it to their repertoire rather than due to their desire to revive it but I sure hope I'm wrong about that. As an xbone owner none of their IPs interest me. Scalebound does so fingers crossed. Replacing the generic white boy with a D&D style Dragonborn would be enough to save Scalebound. You never know he wouldn't turn into some dragon hybrid eventually, maybe fusing with his dragon pal. It's platinum, after all. Maybe they'd call it dragon trigger as an homage to Devil Trigger in Dmc. I'm willing to bet that they're just doing it to protect that trademark and keep the assets because of course they can. I don't have an Xbone, but Scalebound would have given me a strong reason to get one since I love Platinum. I doubt they would continue its production, which is a shame. It did look like an interesting premise. My own cynical side is worried that they will pull an Overstrike a Fuse. If that happens... well, I guess I am happy I never bought an Xbone. I'd bet its going to be a Windows Store exclusive. It'd bomb in Japan like Microsoft's track record of trying to break into that market shows, and there's more fans of Platinum's games on PC outside of Japan than in Japan at this point.